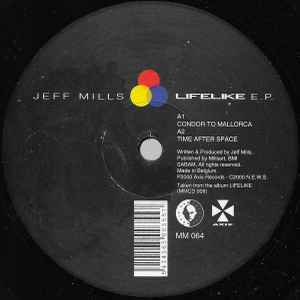 Jeff Mills ‎– Lifelike E.P. P2000 Axis Records - C2000 N.E.W.S. The both ‘AX 021’ etched on the runout grooves are crossed out. The spine of the sleeve is printed. ‘Time After Space’ contains the exact same audio as ‘Global Factor’ on Lifelike CD release. ‘Taken from the album Lifelike’ is incorrectly listed as ‘(MMCD 008)’, instead of 007. The release comes sometimes with an additional promo sticker from the labels. Other: White innersleeve with only one hole and curved corners. Condor To Mallorca is truly the ethereal journey the title suggests. Those inspiration key strikes backed with excellent calypso-esque percussive programming that yield finally to the kickdrum. Then the second 'string plucking' element arrives and this piece takes on a more sinister form. A strong opening to this EP of troubling musical themes. Time After Space is a particularly special record. I enjoy most Jeff Mill's ability to create a feeling like there has just been some cosmic disturbance when this song is on. His use of tension and sparse minimalism is inspiring. Detached moves me in a way I found perhaps with only some if his most special mixtures. Avenger simply polishes you off with percussive frenzy and an ebb end flow of those stiff key stabs. A special record that moves through many of the broader themes in Jeff Mill's work...not sparing the unique and potent results of each individual piece. A must find for fans of Jeff Mills i/m/h/o.